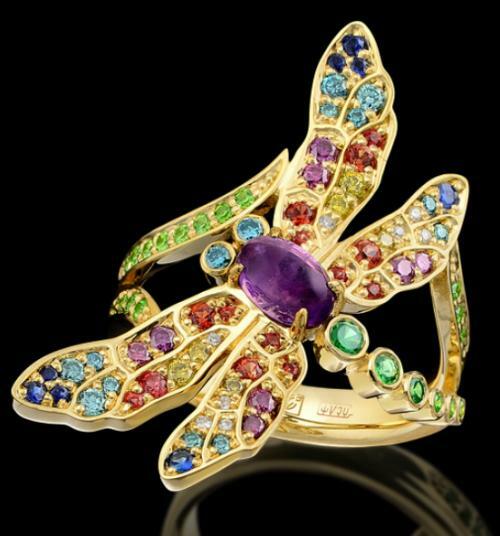 The symbolism of a dragonfly is quite contradictory. In the East, it is a symbol of the coming summer. 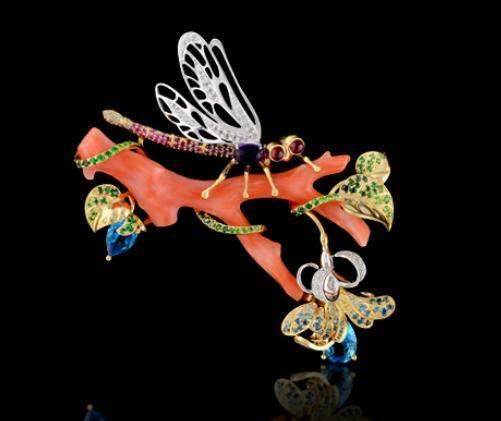 The Japanese consider dragonflies a symbol of military valor, they were sacrificed to the gods, asking for victory. 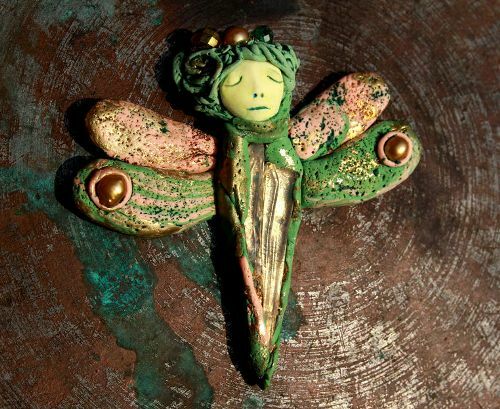 According to legend, the island of Honshu was called the Island of dragonfly. 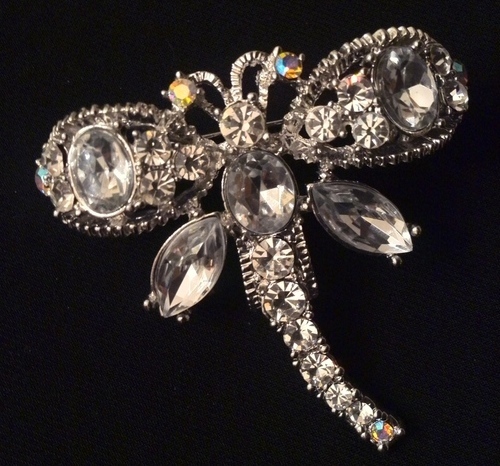 A dragonfly Tunb, which symbolizes Japan’s courage, brings happiness and good fortune. 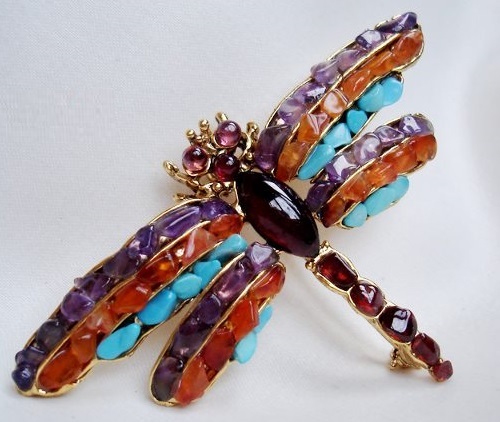 For the American Indians dragonfly embodies whirlwind speed and activity. 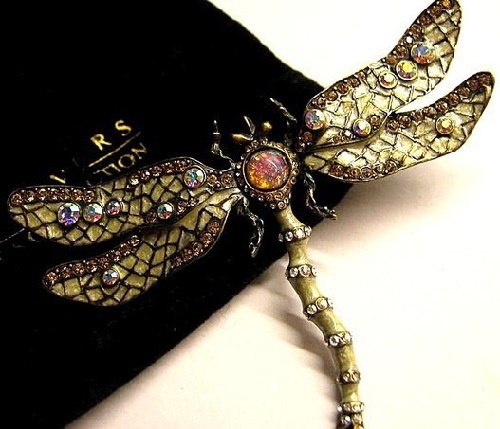 In the West, dragonfly is often associated with witches (in the English language, the word sounds like a dragonfly, literally – “the Dragon Fly”). Also, sometimes it can share the symbolism of the butterfly, which embodies immortality and regeneration. 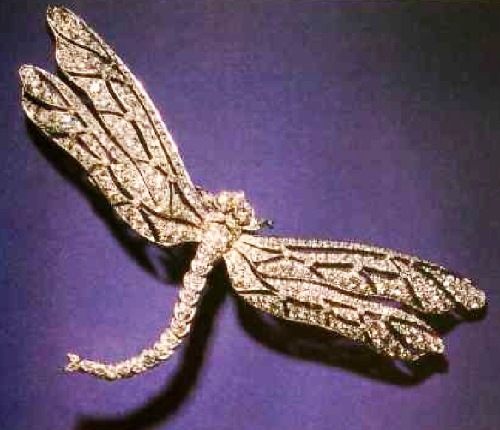 As a seasonal symbol in Japan, the dragonfly is associated with autumn. 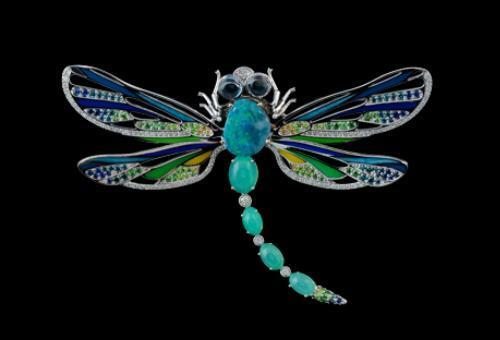 More generally, dragonflies are symbols of courage, strength, and happiness, and they often appear in art and literature, especially haiku. Japanese children catch large dragonflies as a game, using a hair with a small pebble tied to each end, which they throw into the air. 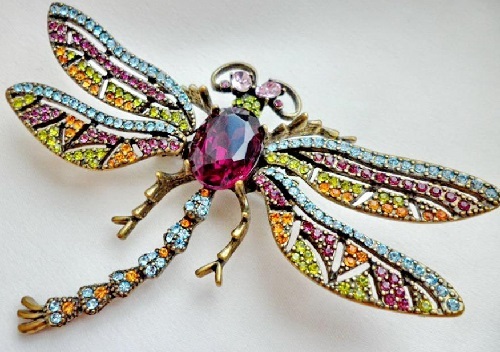 Swedish folklore holds that the devil uses dragonflies to weigh people’s souls. The Norwegian name for dragonflies is “eye-poker”, and in Portugal, they are sometimes called “eyes-snatcher”. They are often associated with snakes, as in the Welsh name gwas-y-neidr, “adder’s servant”. The Southern United States term “snake doctor” refers to a folk belief that dragonflies follow snakes around and stitch them back together if they are injured. 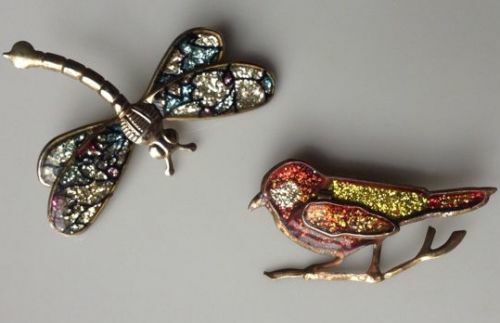 Dragonflies are considered to be “typically female” along with images of butterflies and flowers, paying attention to the fragility, vulnerability, ease of these insects without giving the value of their endurance, strength, predatory habits. Still, the perception of a dragonfly, at least is ambivalent, and if you want to emphasize the combination of fragility and inner strength, then this character – for you. 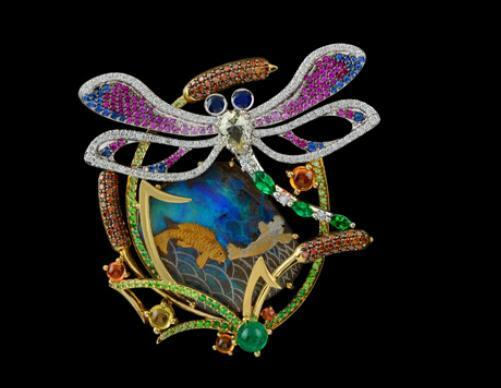 Images of dragonflies are common in Art Nouveau, especially in jewellery designs. 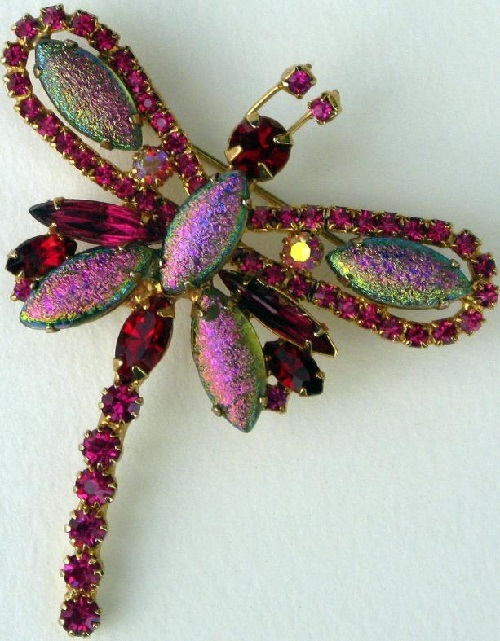 Dragonfly brooch with rubies and diamonds by jewellery company ESG (Emanuel and Sophie Guillaume). 2000. ESG House embodied naturalistic motifs through innovative vanguard technologies. 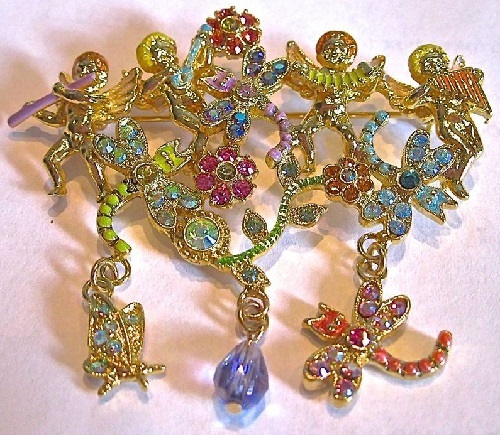 This brooch made of titanium alloy. 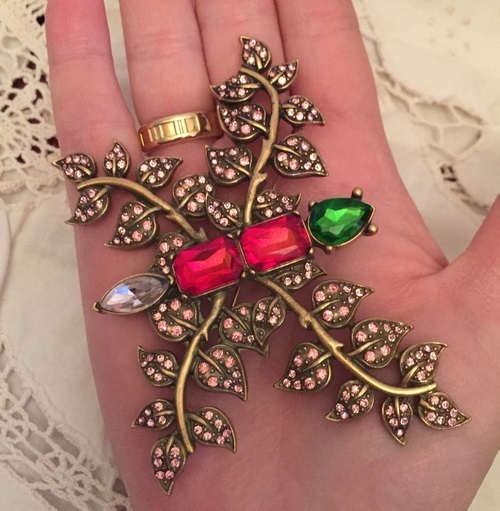 Rubies perfectly match in color – all Burma origin. By the winter’s first roar. 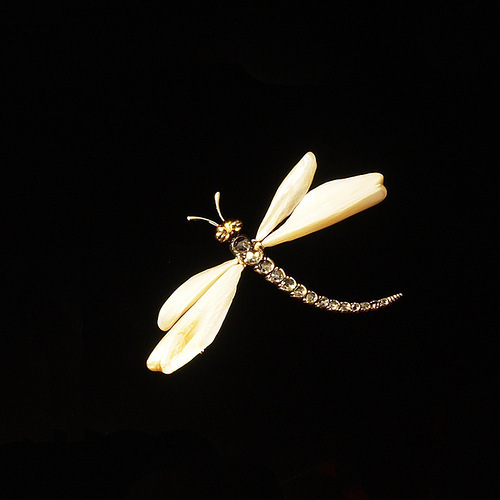 Generally, a dragonfly – one of the oldest insects, her remains were found in the sediments of coal Jurassic times. These delicate insects did not only survive, but have spread to all parts of the world. Dragonflies enjoyed great respect among the Japanese, they are considered a symbol of martial valor. To it were dedicated a lot of haiku. 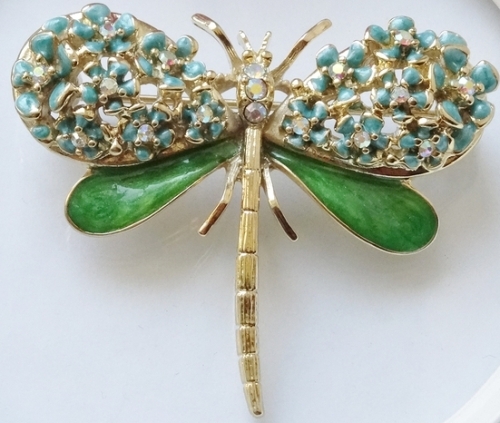 In China, the dragonfly is associated with the onset of summer, instability and weakness. These insects – the most sensitive indicators of the rainy season, the impending change of weather can be found on their behavior. 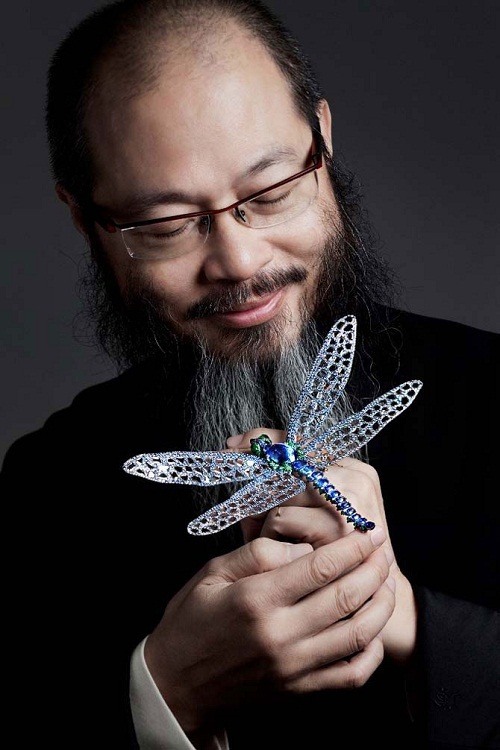 Miniaturist Chen Fong Shin on the wings of dragonflies not only painted but also wrote poetry. 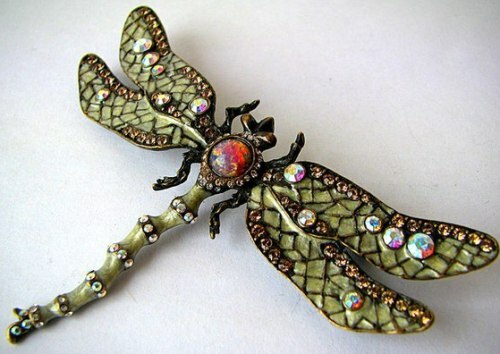 Slavic peoples took dragonflies with fear and prejudice, considered them related to evil. Generally, insects – the traditional symbol of a brief human existence on earth, and dragonflies and butterflies – a symbol of salvation. 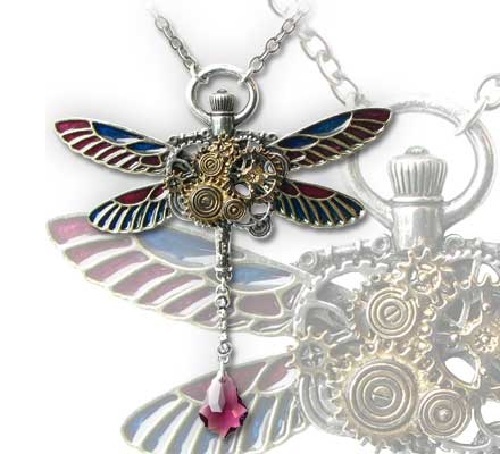 Today dragonfly – a symbol of lightness, grace, levity, speed. Sometimes, like a butterfly, it represents immortality, rebirth, and that in relation to our senses – their ability to recover. Dragonfly belongs to two worlds. Her iridescent wings evoke memories of the magical time, and help realize that in this world there is only the visible reality. Looking at the dragonfly, it seems that our lives are as fleeting, that we should not turn it into a sad reality. 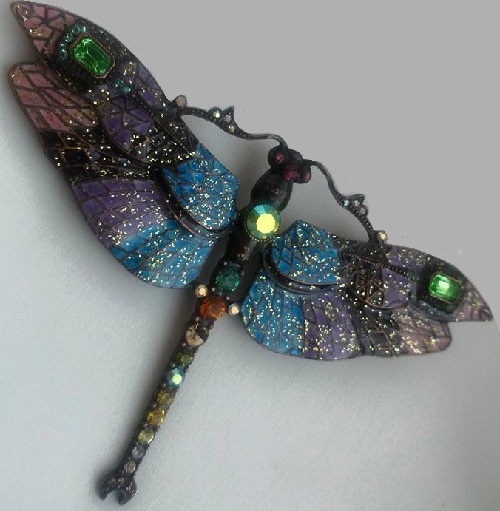 If you want to change something in your family and sexual life, please refer to the energy of dragonflies, because according to feng shui, the symbol of Dragonfly is used to wish the ease and innovation in partnerships. 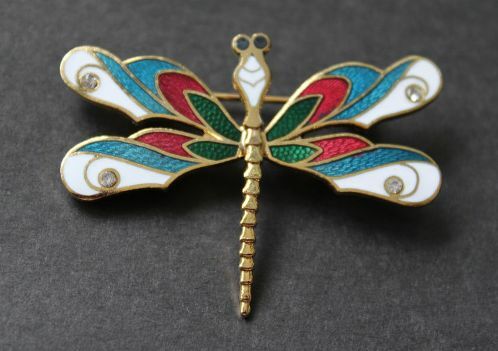 Japanese vintage brooch – enamel in the form of a lovely dragonfly with beautiful, soft enamel colors gentle reminder of the warm and sunny summer spring. 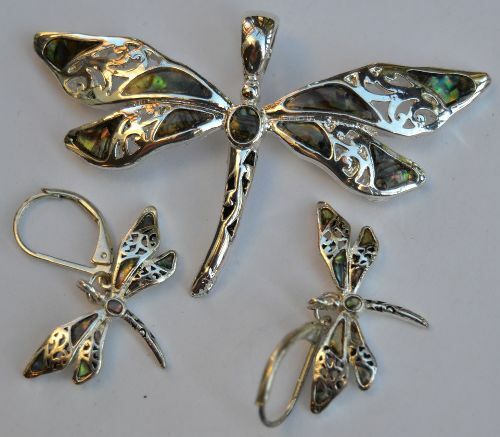 A unique feature of the dragonfly is the fact that it begins its life in the water, and then it has wings and can fly. Thus, the dragonfly is able to conquer the two elements – water and air. 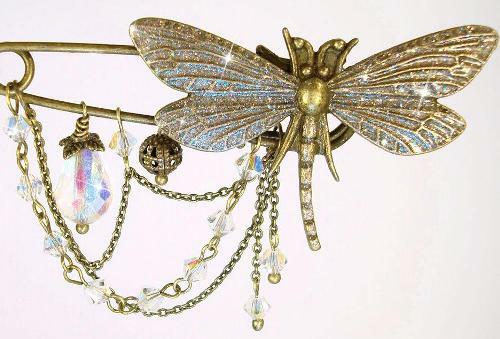 Modern woman burdened with many problems often can not afford dragonfly lightness. It is hoped that this character somehow magically is able to give her power of flight, carelessness and joy.